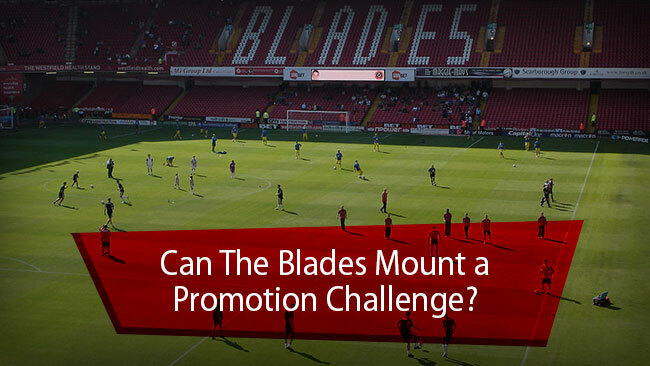 Can The Blades Mount a Promotion Challenge in 2018/19? Most Sheffield United fans would have been delighted with a midtable finish in the Championship if it had been offered at the beginning of the 2017/18 campaign. Having spent six seasons in League One, it was with great joy that the Blades were finally promoted back to the Championship in the 2016/17 season. Having amassed a very impressive total of 100 points to finish top of the table, fans were feeling good heading into the new season but anxious about what was going to happen. It comes as a testament to the magnificent work by Chris Wilder as manager of the club, that a 10th place finish in the Championship last season was considered as a disappointing result for some fans. Despite securing a midtable finish in the first season back in the second tier of English football, there was a feeling amongst many associated with the club that an opportunity had been missed. If the Blades had managed to continue their push for a play-off spot until the end of the season, back-to-back promotions could have been on the cards. While automatic promotion was never a realistic aim, there was plenty of opportunity for Sheffield United to make a statement in the group of teams contesting the playoff positions. 2017/18 was a season which saw both Manchester City and Wolverhampton Wanderers dominate their respective leagues in the top two tiers of English football, with City's squad being lauded as one of the best to ever grace the Premiership. Having defeated Norwich City 2-0 away from home on the 31st October 2017, Wolves went to the top of the Championship and remained there for the rest of the season. At the end of the campaign, Sheffield United finished 6 points adrift of Derby County, who clinched the final playoff spot. October proved a big turning point for Wolves in their promotion bid and so it could have been for Sheffield United. Having defeated Leeds United 2-1 away from home, which was a great result, the Blades moved into first place in the Championship. Despite some indifferent results through November and into the New Year, Sheffield United emerged from the away match at Norwich City with a win and sixth place in the Championship table. However, this was as high as the club would be for the remainder of the campaign and having defeated Reading 3-1 away to climb back into the playoff places, that’s where the dream would end. Just three wins from the last eleven games of the season saw any hopes of a place in the playoffs diminish, but while it felt disappointing at the time, the fact remains it was a very good season for the club. Sheffield United were competitive in most Championship matches and you would rarely see the team outplayed. Only on four occasions did the club lose by 2 or more goals and that highlights what a great job Wilder has done in making Sheffield United a difficult to team to beat at Championship level. Three of those four defeats came away from home at the three promoted clubs, which suggests there was not much between Sheffield United and the remaining teams in the top half of the Championship table last season. There may have been times when Sheffield United could have managed the game better and played to keep a point rather than go for the win and lose all three. That’s something which could be assessed ahead of next season but is a minor criticism in what was a very good campaign. If Paul Coutts had avoided injury and the board spent in the January transfer market, Sheffield United could have finished higher and it’s the latter which fans will be looking for this summer. However, there are issues at boardroom level which must be solved if the club is to move in the right direction. This sounds promising and the Blades have been busy bringing in the next wave of talent, including German goalkeeper Jordan Yamoah Amissah and four other youth players for the academy. These players may not have a direct impact on next season but it shows how the club is investing in the future, hopefully a future in the Premier League. Discussion: Can The Blades Mount a Promotion Challenge in 2018/19? Handcrafted in Symi, Hellas. Page created in 0.282 seconds.